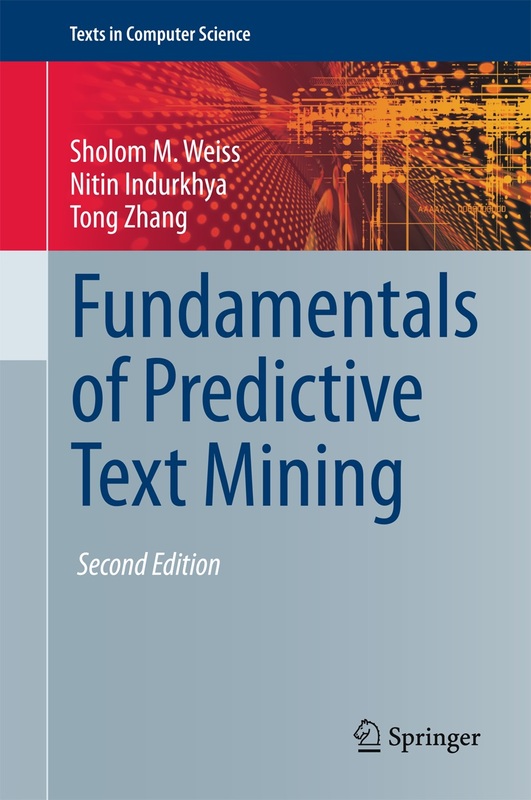 Fundamentals of Predictive Text Mining (2nd Edition) is published by Springer (2016). This successful textbook on predictive text mining offers a unified perspective on a rapidly evolving field, integrating topics spanning the varied disciplines of data science, machine learning, databases, and computational linguistics. Serving also as a practical guide, this unique book provides helpful advice illustrated by examples and case studies. This highly anticipated second edition has been thoroughly revised and expanded with new material on deep learning, graph models, mining social media, errors and pitfalls in big data evaluation, Twitter sentiment analysis, and dependency parsing discussion. The fully updated content also features in-depth discussions on issues of document classification, information retrieval, clustering and organizing documents, information extraction, web-based data-sourcing, and prediction and evaluation. The book is independent of any particular software. Readers have the option to download the Text-Miner Software Kit (TMSK) and the Rule Induction Kit for Text (RIKTEXT), two software packages for predictive text mining. Teaching aids and instructional materials are available from the Springer website for registered SpringerLink customers. Contact Springer for details. Online ordering is recommended (search for the book by title or authors) at Amazon.com or Springer. You can also find the book in other online bookstores. It is available in both hardcover and ebook formats. Issues related to orders/refunds for the book should be addressed to the retailer from where the book is purchased. Our book Predictive Data Mining: A Practical Guide published by Morgan Kaufmann (1998) was the first book to introduce the concept of "big data" and the related data-mining concepts of (a) data preparation (b) data reduction or sampling and (c) prediction methods. Online ordering is recommended (search for the book by title or authors) at Amazon.com. You can also find the book in other online bookstores.